THE MUNICIPAL authority of Bhopal is scrambling to save the image of the lake city, literally. Since September last year, they have been frantically removing sludge, algae and water hyacinth from Shahpura lake, one of the most polluted lakes of Bhopal. They are also installing metal mesh around the lake to prevent plastic waste and other debris from entering into it. 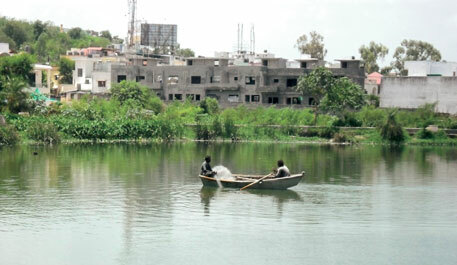 The lake will regain its glory by April 2016, claim officials of the Bhopal Municipal Corporation (BMC). Shahpuralake, also called Mansarovar, came into being in 1974-1975 after an earthen dam was built near Chunabhatti village in the southern part of Bhopal under the Betwa irrigation scheme. Surrounded by hillocks, it became the third important lake in Bhopal after the Upper and Lower lakes. People started depending on it for drinking water, irrigation and pisciculture. Within a few years, housing colonies replaced the hillocks and encroached the lake’s catchment area, spanning 8.29 sq km. By early 2000s, the lake turned into a sewage pond. People living in the surrounding areas repeatedly complained of the stench to BMC but to little avail. BMC’Srecent attempt to clean the lake began following an order by the National Green Tribunal (NGT), which was hearing a petition by Bhopal-based environmentalist Subhash Chandra Pandey in 2011. Pandey had stated that the lake water has been severely contaminated by raw sewage. Laboratory analysis of the lake water gives credence to the complaints. According to Madhya Pradesh’s Bureau of Designs for Hydel and Irrigation (BODHI), biochemical oxygen demand (BOD) of the lake water was 19.2 mg/litre during 2011-12. Going by the standard set by the Central Pollution Control Board, water with such high BOD level is not suitable even for bathing. Harish Chandra Kataria, chemistry professor at the Government Geetanjali Girls P G (Autonomus) College, Bhopal, who regularly analyses the lake water, had also found high levels of nitrates, phosphates and coliform bacteria, indicating sewage contamination. BMC plans to remove the pollutants and revive the lake in two phases by spending a whopping Rs 12 crore. In the first phase, it will clean the lake and install structures such as metal mesh to prevent further pollution. The second phase involves conservation and maintenance of the lake and its surrounding areas. BMC plans to develop the lake as a tourist centre. The state’s Urban Administration and Development Department (UADD) has sanctioned Rs 4 crore to BMC for restoration of the lake, says Pravin Bhagwat, state coordinator, UADD. Analysis of the restoration plan, which BMC submitted to NGT in September 2014, shows it is not adequate to keep the lake clean. The lake’s surrounding residential area, also called New Bhopal, has a 108 km long sewer line with six pumping stations and two sewage treatment plants (STPs). But these are inadequate to handle the wastewater generated by the ever- expanding population of the area. The sewerage system is 40 years old and is crumbling. The bio-filter plants at the STPs do not function properly. Treated effluent from the STPsare discharged into nearby drains that pass through densely populated slums, carrying untreated sewage, before joining the lake. In 2008-09, Savita Dixit, chemistry professor at Maulana Azad National Institute of Technology, Bhopal, found high concentration of heavy metals like copper, chromium, lead, cadmium and manganese in the lake water. She has linked it to idol immersion. Since the lake is used for pisciculture and irrigation, researchers say the heavy metals may have entered the food chain. To check the contamination from idol immersion, BMC’s lake restoration plan suggests creating separate structures away from the lake. To prevent sewage water contamination, the plan suggests setting up more STPs and intercepting all drains joining Shahpuralake and carrying the sewage water to STPS for treatment. Researchers say STPs may fail to handle the wastewater load generated by the urban sprawl of New Bhopal. Kataria suggests that BMC must introduce decentralised treatment techniques at all the drains joining the lake. These techniques include simple biological processes involving microbes, he adds. Such measures will go a long way in preventing groundwater contamination, which does not find a mention in BMC’s plan. Polluted lake water has already contaminated groundwater around the lake. Kataria’s analyses show that the levels of nitrate and phosphate in the groundwater are at least double the limit prescribed by WHO for drinking water. His colleague Sonal Trivedi also found faecal coliform in the groundwater around the lake. Sanjeev Shekhar Roy, chief chemist with BODHI, says about 90,000 people depend on the groundwater pumped from areas around the lake. Tankers regularly tap tubewells located near the lake to supply drinking water to Chunabhatti and other areas. Since water tainted with faecal coliform cannot be treated, people should avoid using contaminated tubewells, says Kataria. Roy says BODHI had worked with researchers to implement decentralised wastewater treatment techniques around the lake on a pilot basis. He has seen considerable change in the quality of water in the shallow wells dug in the vicinity of the lakes following implementation of the pilot projects. Following BMC’s initial restoration work, the lake now appears clean. But there are still concerns about its water quality, says Abhijeet Saboo, urban planner, studying lakes of Bhopal. Saswat Bandhyopadhyay, head of the department of environmental planning, Centre for Environmental Planning and Technology University (CEPT), says BMC should be careful while implementing conservation measures. It should not concentrate on architectural and ornamental steps but should focus on reviving the quality of lake water. Bandhyopadhyay is the key person involved in preparing a restoration plan for the Upper Lake. Dixit adds that periodical monitoring of the lake water quality and infrastructure is important. BMC should include these in its lake restoration plan.